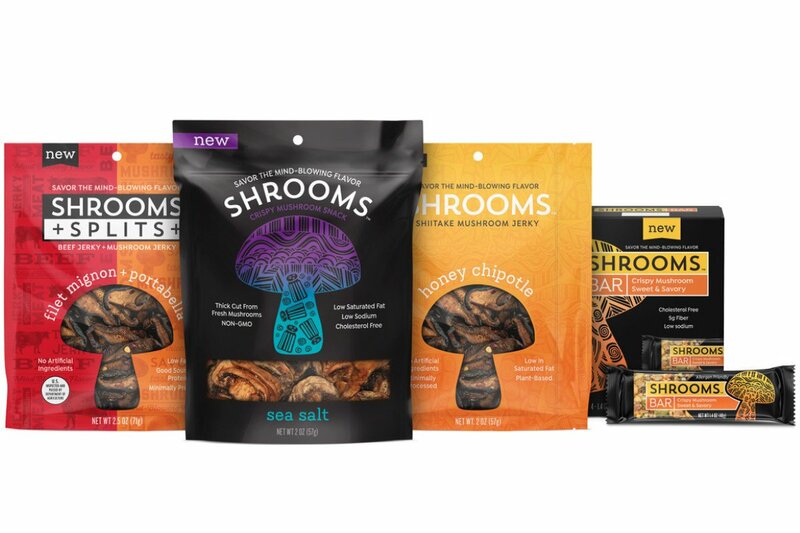 South Mill Champs, one of North America’s largest mushroom growers, announced the launch of the company’s new snack food venture, Shrooms Snacks. The brand aims to provide great tasting, better-for-you snacks using mushrooms grown and handpicked on the South Mill farms in Kennett Square, Pennsylvania, the mushroom capital of the world. Shrooms Crispy Mushrooms (SRP $5.99, 2.0 oz): These crispy-crunchy snacks made from fresh, thick-cut mushrooms are the first of their kind. Available in five mind-blowing flavors including Sea Salt, Spicy Jalapeno, Mesquite Barbeque, Pizza and Original Portabella, Shrooms Crispy Mushroom Snacks are like nothing you’ve ever crunched. Shrooms Mushroom Jerky (SRP $6.99, 2.5 oz): Made from tender shiitake and meaty portabella mushroom caps and packed with nature’s goodness, this next generation jerky takes your taste buds on an unforgettable trip. Shrooms Mushroom Jerky is deep-marinated a full day to produce three robust, adventurous flavors including Honey Chipotle Shiitake, Roasted Teriyaki Portabella, and Original Portabella. Shrooms Splits Jerky (SRP $7.99, 2.5 oz): This ultimate hybrid snack pairs marinated mushroom jerky made from meaty portabella mushroom caps with other perfectly chewy jerky varieties including Turkey, Berries, Filet Mignon and Peppered Beef, which are made from grass-fed, USA-bred beef. All four varieties create an unforgettable snacking experience. Shrooms Snack Bar (SRP $7.96 4-pack; $1.99 single): A game-changing, allergy-friendly bar made from simple, wholesome ingredients including crispy mushrooms that will satisfy your craving for the extraordinary. Flavors including Crispy Mushroom Chocolate Chunk and Crispy Mushroom Sweet & Savory will change everything you know about snack bars. Look for additional adventurous flavors to be announced soon!